Die amerikanische Zeitschrift „Businessweek“ hat in ihrer aktuellen Ausgabe ein pessimistisches Bild von der Zukunft Deutschlands gezeichnet. Vor allem eine Schlüsselbranche wird scharf kritisiert. Die amerikanische Zeitschrift „Businessweek“ widmet Deutschlands Wirtschaft eine große Titelgeschichte. Ihr Urteil ist vernichtend, die Zukunft erscheint in düsteren Farben. Das Urteil über Angela Merkel überrascht. Es kommt nicht oft vor, dass Deutschland in englischsprachigen Magazinen das Topthema ist. Wenn sie das Land jedoch auf die Titelseite heben, dann, weil sie einen großen, langfristigen Trend erkannt haben, meist zu Recht – im Guten wie im Schlechten. Beispielhaft war das Cover des britischen „Economist“, der im August 2005 „Germany’s surprising economy“ erkannte. Und tatsächlich überraschte die deutsche Wirtschaft in den folgenden Jahren viele, denn es folgte eine goldene Ära mit hohem Wachstum und stetig sinkenden Arbeitslosenzahlen. Popes, really. Francis owes a nonfinancial debt to his predecessors. Pope Francis rankles critics who, seeing his campaigns against poverty and climate change, wish he would drop the economist act and stick to theology. The debate, already under way for months, should peak as the bishop of Rome starts on a six-day U.S. trip. The pope’s take on the market economy boils down to three sentences, two of which don’t even belong to him. They do belong to the Vatican, which over the last 125 years has established a body of social doctrine intended to champion the poor and the vulnerable while protecting the natural environment. The positions of Pope Francis and his predecessors on economic matters are largely consistent and can be distilled into one statement from each of the last three popes. Remember when emerging economies were supposed to save us all? After the 2008 financial crisis, the traditional engines of global growth—the U.S., Western Europe, and Japan—stumbled into recession. To the rescue came the once-poor developing world. China, India, Brazil, and other up-and-comers powered the global economy through the historic downturn. The meek were inheriting the earth. 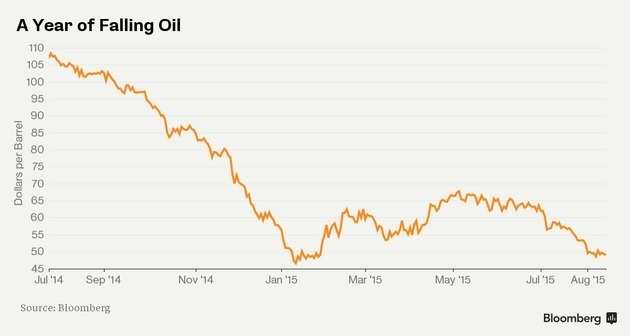 As crude tumbles in its worst summer ever, experts are lining up to forecast exactly how low it will go. Among the lowest so far is $10 to $20 a barrel, which came from Gary Shilling, president of A. Gary Shilling Co., who spoke in a Bloomberg Television interview on Friday. Because fixed costs are already spent, drillers in a “price war” will keep pumping as long as prices are above the cash costs of production, which are below today’s levels of around $49 a barrel in London. The Greek government said it can survive another week without defaulting on the International Monetary Fund as European officials warned the window for accessing aid is closing. Greece will be able to scrape together enough cash to make a payment of about 300 million euros ($329 million) due to the IMF on June 5, Economy Minister George Stathakis said in an interview with Real News newspaper published Friday. The investment of choice for bulls seeking risk, value and domestic growth? The shares have jumped 28 percent since a January low, but they’re still trading at a discount to their two-year average, making the industry among the cheapest in the region. The cost of options protecting against bank stock swings this month reached the lowest level in more than five years versus those on the Euro Stoxx 50 Index. The euro-area economy is riding the biggest wave of liquidity since the birth of the single currency to its fastest expansion in four years. The long-term laggard of global growth is for now even outpacing the U.S as it cashes in on ultra-loose monetary policy, weakness in the euro and oil prices, fading fiscal austerity, surging stocks and renewed bank lending. Barclays Plc reckons such forces make overall monetary and financial conditions the easiest since the euro began trading in 1999. Euro-area finance ministers voiced their frustration with Greece after Prime Minister Alexis Tsipras tried to bypass their veto on financial aid with an appeal to Angela Merkel. With Greece running out of money and stalling over commitments to reform, euro-zone finance chiefs meeting in Riga, Latvia, Friday said the country’s authorities still haven’t shown sufficient progress on plans to revamp the economy to justify a loan payout. Here are five things to watch for from Mario Draghi on Wednesday. The European Central Bank president holds a press conference at 2:30 p.m. in Frankfurt, 45 minutes after the Governing Council’s announcement on interest rates. Must we really start worrying about tapering? The ECB began large-scale asset purchases in March and said national central banks scooped up 61.7 billion euros ($66 billions) of government and public-sector bonds as of April 10. 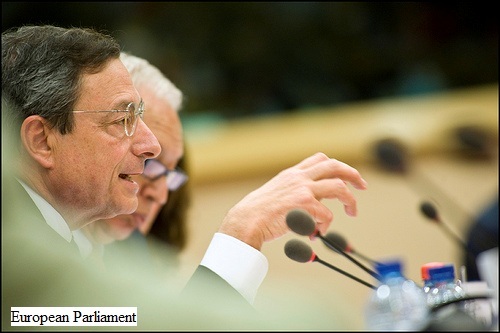 With the economic recovery gaining strength and survey data showing that quantitative easing is spurring credit, Draghi will be able to vaunt the positive effects of its latest stimulus measure just five weeks after its start. So much so, in fact, that the ECB president may be asked about the chances of an early exit from the program. ECB Executive Board member Yves Mersch hinted at the prospect in an April 8 interview. He also said purchases can be extended if needed. Draghi is likely to dismiss talk of tapering at this stage, referring to the latest ECB economic projections as a reason to continue with the purchases until their intended end. Bondholders who held their nerve as Greece sparred with the euro region are now reaping the rewards. Sticking with Greek securities through the election of the anti-austerity Syriza party a month ago — and the turmoil of ensuing funding negotiations — handed investors the best returns globally this year, according to Bloomberg indexes of sovereign bonds. Traders of Greek debt were relatively sanguine as they braved heightened volatility and warnings from strategists that the nation risked an exit from the currency bloc.